This site is a collection of personal pages focused mostly on how to have fun making or doing things on your own for little or no money plus a few things I make by hand and sell to help pay the bills. The theme of this site is inspired by a wonderful and extremely odd named old book, Dolly Freed's POSSUM LIVING, and people like Euell Gibbons, Robb White and Henri Mignet and others that appealed to me by their contrary actions and zest for life. As you all know,life is very short, but it can also be wide. If your life seems narrow and not much fun lately then here are, I hope, some low cost ways you can get up off the floor and go out and mess around a bit while you still can. To help put some food on my table I also offer a few self-made and humble items and plans, how to do it books, and simple DVDs on topics I am interested in, usually of an outdoor and homemade or frugal nature with a South Florida slant. Please check out my pages below for fun stuff to make or do. My Domain names and websites for sale. How to make large quick and easy Rustic wooden frames for your paintings for less than $10 each. RCA Small Wonder and Flip Video camera review- perhaps best cheap videocamera for making youtube videos in world. $29 Walmart Inflatable boat, plus home built floorboards with trolling motor make amazingly useful and cheap boat. The Pouchel- a Flying Flea airplane design you build from ladders! How to build a low cost foam cement home with do it yourself SCIP panels. How to Make your Car,Tractor,Truck or Boat run on wood! Gyotaku- how to earn extra money making and framing prints of fish you catch. How to import from China and India right to your front door- if I did it, anybody can! Build "Uncle Fred" the amazing $400 folding houseboat. These Panfisheman's Secrets guarantee fish on the table.How to outfish, outclean and outcook nearly every other panfisherman. How to catch an AntLion- fun for the kids. How to videotape your friends wedding and stay friends. Duckworks, the best small boat messing about site on the web. Dave Tackett makes and sells stuff to help pay the bills just like me. He specializes in home made fishing items , PFD Fishing cartoon books and has some of the most fun low cost fishing videos on the web. I have been fishing forever and loved his quick fish cleaning dvd. I have consistently found more good money saving ideas on this site than any other. If you are an optimist and think technology will find a way for us to coexist with our environment this is the place to find the latest news on what breaking technology is going to help change the world. I found some geothermal info here I saw no where else. Good alternative/future site. Note: My underwater camera housings are no longer made or sold, I stopped production in 2011. however, if you are interested in buying a DVD on how to make them yourself, you can purchase the DVD on eBay. The following is copy about the housings I left online detailing the housings and their attributes. The NEMO 200 and the Shorty NEMO are two reliable,well made and affordable video camera housings I make myself. They can be used with many makes and models of video cameras. The housing can go to 150 feet depth and come with a 6 months warranty. Please read the customer feedback of my many happy customers. You can buy theNEMO 200 or Shorty housing from me on my webpage at NEMOHOUSING.COM or on eBay. I'd be happy to make you one. The following is my auction ads for the NEMO 200 & Little NEMO on eBay. Great Housing. Simple to use and works GREAT. Thanks!!!!!!!! Super fast shipping! Awesome product and Great Seller! What a DEAL! Thanks for a very good transaction and very prompt shipping. Simplistic yet innovative product. Hats off! 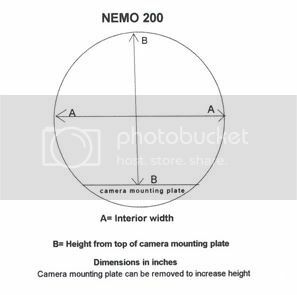 The NEMO 200 is my third underwater video camera housing design. and is the best one I have made so far. This new design is low cost, low maintenance, very durable, and gets the job done. It is large enough to enable many different video cameras to fit inside. With this housing and nearly any old camcorder you have lying around you can now record all of your dive and boating adventures and share them forever with your family and friends. Here are some reasons I am excited about this housing. This low cost housing will allow you to use nearly any small to medium size camcorder to capture the fun and excitement of your next dive trip on video. Just about everyone has an old camcorder laying around the house or gathering dust in the closet. Now you can put that camcorder back to good use with this low cost housing on your next dive. Having your own personal underwater video camera housing will truly increase the fun you get from diving and allow you and your family to relive your diving experiences on tape forever! The NEMO 200 is a smart buy. It is well made from quality marine grade plastics, stainless steel, aluminum, Buna rubber o-ring and acrylic lens. The housing is rated to 120 feet. Currently, the retail price in dive shops and dive resorts for similar housings is $275-$350. . The following are the interior dimensions so you can verify that the camera you have will fit. Nearly any small to medium 8mm, Hi8mm, VHS_C or SVHS_C camera made in the last 10 years will fit. Naturally, the housing will take many of the smaller digital video cameras now available too. A Interior width or diameter 5 & 3/4"
B Interior Height from camera mounting plate to inside top 5"
C Interior Length is usually 10&1/4" plus or minus a half inch. The length varies due to production method used, if you need an exact and precise length let me know and I can arrange that for you. There are no exterior buttons, levers or controls to break or go bad.If your camera has a remote control, as many camcorders have, then you simply insert your camera and close the housing and use your remote to start the camera filming right before the dive and it will continue to record throughout your dive capturing everything you see. If you don't have a remote you can start your camera recording before it is locked in place inside the housing. The Housing comes with a 6 month warranty covering all parts and labor. 1. Quality, Durable Materials made to withstand the marine environment. 2. The Housing can use many models of Camcorders except large VHS cameras. 2.Quick shipping, no handling charges. 3. Six month warranty and limited time refund policy for USA buyers, See Frequently asked question section for more refund or warranty details. 5. 150 feet depth rating-Best depth rating for price. 6. Reliable. Fewer parts and controls to leak or malfunction. 7.Video can take 1000 times more film than still cameras.20 frames of video per second for a 1/2 hour dive trip equals 36000 shots. A still camera can only take 36 shots in that same half hour. Video will capture the sound of your trip too. 9. Your accessories and lights can mount easily on the top. 10. Made in USA. Parts are available and any out of warranty repair is inexpensive. I have been selling on ebay since 1998 with over 6000 positive feedbacks!